Her departure was first reported by CBS News. In another tweet, Trump said Kevin McAleenan, the current U.S. Customs and Border Protection commissioner, would become acting secretary. Nielsen, 46, had been DHS secretary since December 2017. Her time overseeing the sprawling department included conflict with Trump and overseeing a policy of separating children from their migrant parents at the border with Mexico. Trump has made a clampdown on illegal immigration a centerpiece of his two-year-old presidency, as he has sought to cut back on the number of newcomers, especially Mexicans and Central Americans, entering the United States without proper documentation. Trump insists that the arrival of migrants across the southern U.S. border constitutes a national emergency so important that he sidestepped Congress’ refusal to provide him with several billion dollars he requested to build the border wall. He said in a statement, however, that she should not serve as a scapegoat, blasting Trump for “terrible and cruel policies.” Noting that the department now has neither a permanent secretary nor deputy secretary, he called on the administration to work with Congress in good faith to keep the country safe. The Trump administration adopted the policy of separating migrant children from their parents early last year as part of its “zero tolerance” approach to illegal immigration, intended to deter families from leaving home in the hope of entering the United States. Nielsen’s departure has been rumoured repeatedly. News reports said Trump had belittled her in Cabinet meetings, unhappy with her efforts to tighten immigration. To the brave and dedicated men and women of <a href=”https://twitter.com/DHSgov?ref_src=twsrc%5Etfw”>@DHSgov</a>, I submitted my resignation to the President this evening. I am eternally grateful and proud of what you do each and everyday to protect our homeland- each of you are why I came back to serve my country. 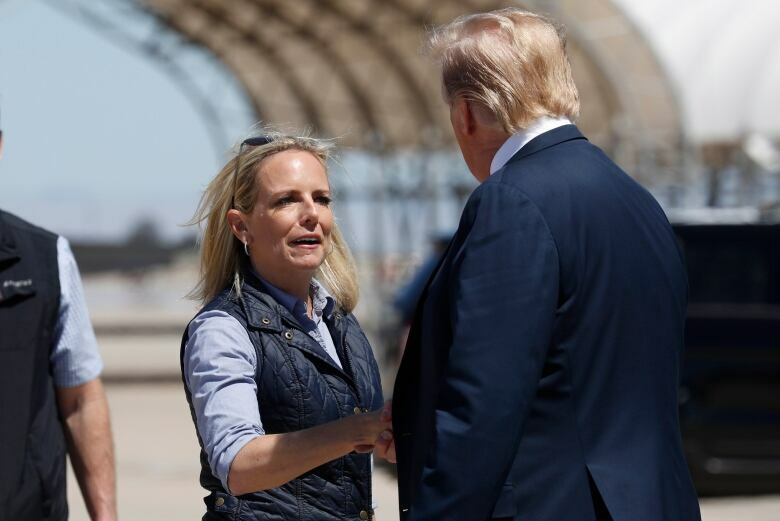 The New York Times reported nearly a year ago, in May 2018, that Nielsen was close to resigning after Trump berated her in front of other Cabinet secretaries over increases in the number of migrants crossing illegally from Mexico. Before she was nominated as secretary, Nielsen worked as a deputy to former Marine Gen. John Kelly, who headed DHS before becoming White House chief of staff.